TV Tuners are add-ons that can turn your monitor into a TV. Phil Craven tunes in to test them out. 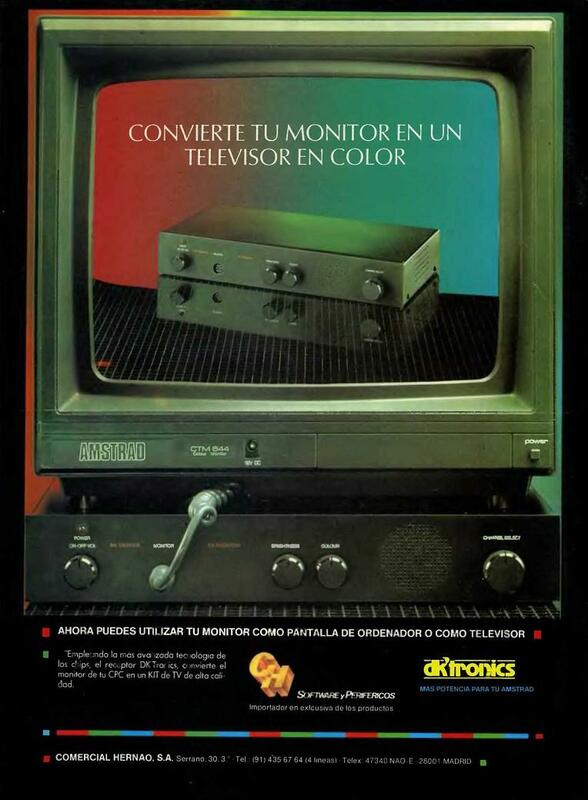 We have all seen advertisements for tuners which will turn our colour monitors into our personal TV sets. We have probably all wondered if they are any good. 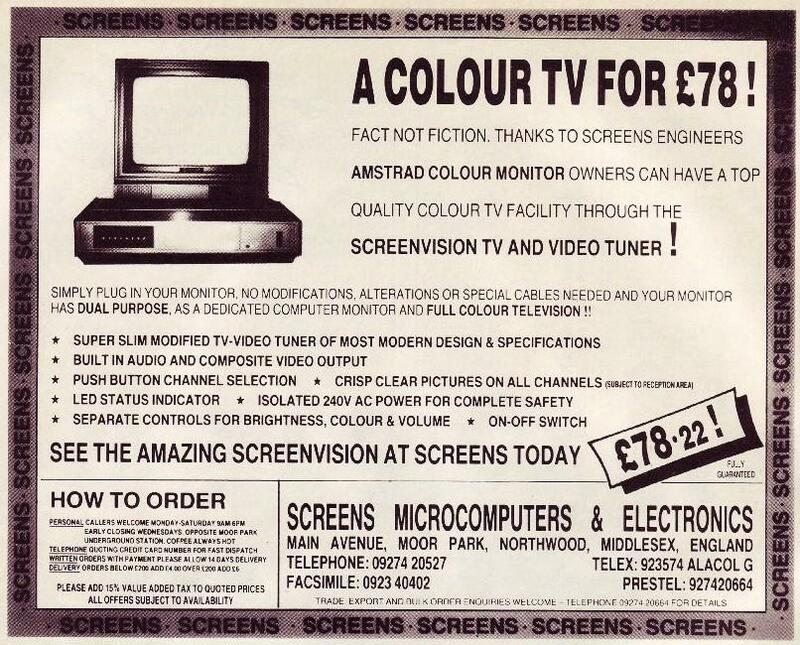 Is the Amstrad monitor resolution good enough for television and, if so, which is the best tuner to buy and why -were questions - which I wanted answers before I committed cash to one of those desirable little devices. Fortunately, I managed recently to obtain all three currently-available models for companson checks and I will share my findings with you. I can say that the Amstrad monitor is certainly good enough for television. There is no noticeable picture difference between it and any other good TV set. On the other hand there are significant differences between the tuners, both in picture quality and features. 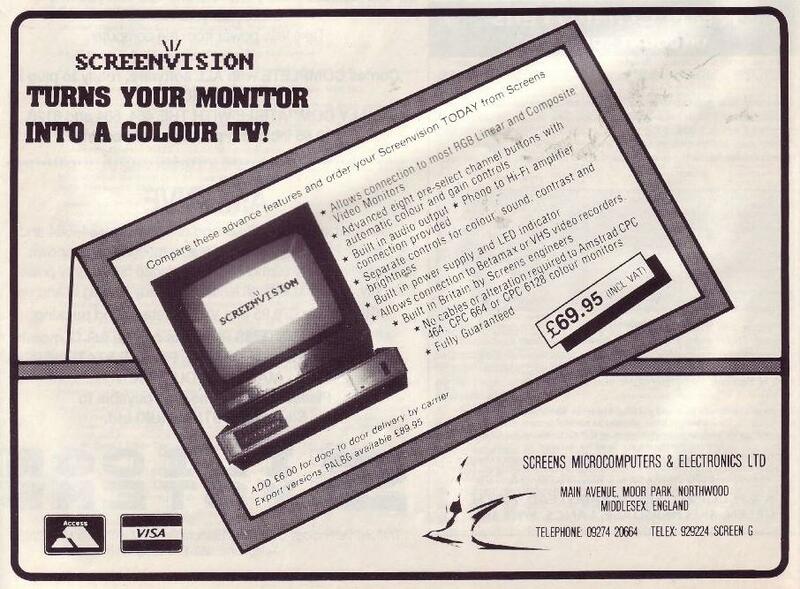 Of the three, only two, the Screenvision and the dK'Tronics, are normally sold on their own. 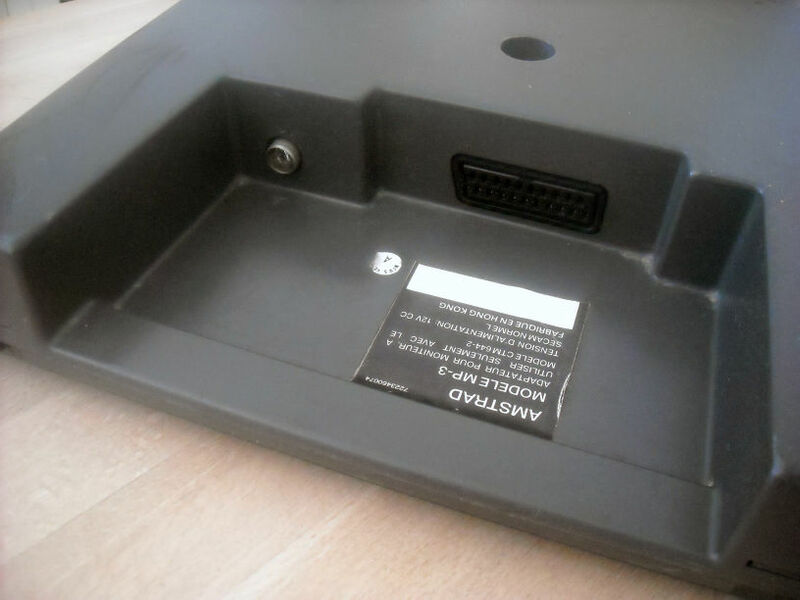 The third, Amstrad, is normally sold either as part of the Entertainment Centre package which includes a 6128 monitor, an alarm clock/radio, bundled software, a joystick and a desk together with the TV tuner, or as the same package but without the 6128, monitor or desk. Comet stores are selling the tuner separately, so we can make direct comparisons. Aspects common to all models are that each has a small built-in speaker so that the sound is somewhat thinner than usual, but you soon become accustomed to that and they all use a standard aerial. Whether or not an indoor aerial can be used depends entirely on the signal strength in the area. If one will work with an ordinary TV set will it work with these tuners, as will a video recorder? The answer is no. You cannot video-tape your computer gaming prowess. You cannot have the TV and the computer on at the same time. The 5-pin din plug from the monitor is connected to either the computer or the tuner but not both. You cannot even switch between the two on any of the models, not even on the Amstrad. You have to pull out the plug of one and puch it in the other and that surprised me. Perhaps someone might produce a cheap little switch which will allow me to continue trying to get through Auntie John's machine code course while flicking over frequently to see if 'Alio 'Alio has started. The dK'Tronics tuner, cased in black-finished metal and with its own power supply, resides behind the computer with the monitor on top. Although its position means that the monitor leads cover part of its front: making access to it slightly more difficult. It is. nevertheless, the best place for it as most of us have machines on desks and tables where space is at a premium. Controls are on/off/volume, brightness, colour and rotary channel selector. It produces plenty of brightness and colour and an excellent picture. I would like to turn down the contrast a little but, without a control, it was a little difficult. Still, it is better to err on the bright side than the dull. As it was designed for the Amstrad. it is possible to connect it to different linear RGB monitors and this is worth noting by those who might one day move to a different computer. The tuner can go with you. MP-3 : The Amstrad entertainment cycle. Like the dK'Tronics tuner, the Amstrad rests under the monitor with the leads across its front, it is cased in strong plastic, matching the CPC livery. Controls are a volume, colour, contrast and rotary channel selector. The brightness control is on the side of the monitor. Power is taken from the 12V monitor outlet, so those without this type of monitor would also need an MP2 modulator. Its picture quality is excellent, as is its colour, yet I have one little complaint. It has the contrast control but I would have liked a little more brightness. Nevertheless, it is eminently watchable. I cannot leave this model without mentioning the other items in the package. The alarm clock/radio, which again can be bought separately for £14.99, matches the tuner and stacks with it and the monitor. Its three wave bands. LW. M W and FM. provide the kind of quality one would expect from a clock/radio of its price and its half-inch red LED alarm clock would be brilliant if the monitor leads did not partially cover it. Even though the radio quality is affected when the monitor is on - badly on MW - it is still an excellent little extra at the price. The joystick is nothing special and the software is satisfactory if you like such oldies as Hunchback 1 and2, although one or two better titles, like Trivial Pursuits, are included. When bundled, the tuner, radio, joystick and software can be bought from the Amstrad User Club for £109.99 or £89.99 to members. The black computer desk costs £10 extra. Annual subscription to the User Club is £24.95, which includes 12 free issues of ACU valued at £16.50 , membership rates costs £8.45. Buy the TV package at the members'rate, saving £20, and you are £10 ahead. Housed in two-tone grey plastic, the screen vision unit made onginally by Rediffusion, has been modified by components manufactured and assembled by Screens and can be connected to any monitor with either composite or linear RGB input. It is not designed to reside under the monitor, so about 16in. x 9in. of desk space is needed. As well as its own power supply it has features I would have liked to have seen on the other two. It has eight push-button channel selectors, which I prefer to the rotary type. It has an audio out socket, so that the sound can be fed to a hi-fi set-up, as well as volume, colour, brightness and contrast controls. What it does not have is a satisfactory picture. It is clear enough but, to achieve any colour intensity, I had to turn the brightness well down, the contrast down as low as it would go and the colour up full - and even those measures did not produce enough. If it had done, the picture was so dull as to make watching unpleasant. I regret that I have to report this fact but it must be said. On the other hand an unmodified version is available, for home assembly, which might be just the thing for electronics buffs. I have not seen it, but at £22.95 it cannot be bad. All the units will work as tuners for the teletext adapter featured in the January issue and the correct lead to connect a particular tuner to the adapter will be supplied by Microtext on request. Quick-thinking readers might have wondered about the possibility of grabbing the monitor 5V lead, by mistake, and plugging it into the 12V outlet. 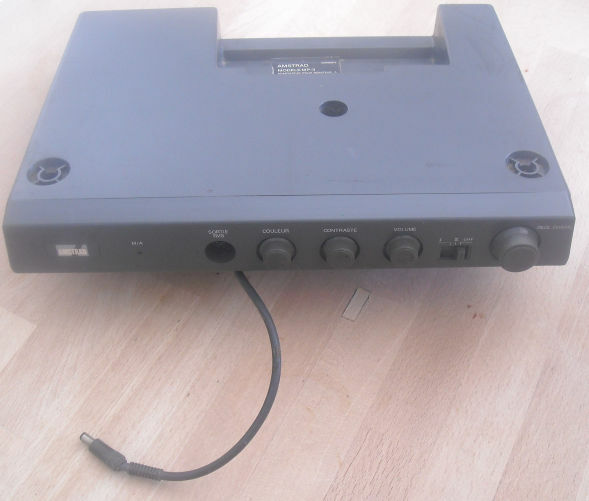 Fortunately, the Amstrad design ensures that both the 12V and 5V lines are fed straight to ground and, so long as the situation does not remain for long, no harm is done. All three versions are well-made and look good but I do not have definite answers to all my original questions. The monitor is capable of displaying excellent TV pictures and the Amstrad and dK'Tronics units are capable of producing them but whether the small differences between them matter or not is a choice only a buyer can make. Having had the advantage of comparing them directly. I cannot say which is best. I can say that both models are sure to delight and not disappoint a new owner. dK'Tronics tuner: £79.95 from Ram Electronics (Fleet) Ltd. Unit 16. Redfields Industrial Park, Redfield Lane, Church Crookham, Hampshire GU13 ORE. Tel: 0252 850085. Amstrad TV tuner: Official Amstrad User Club. Enterprise House, PO Box 10. Roper Street. Pallion Industrial Estate. Sunderland SR4 6SN. Tel: 0915108787. Screenvision: Screens Microcomputers and Electronics, Main Avenue, Moor Park, Northwood, Middlesex HA6 2HJ. Tel: 09274 20664. State that the CPC version is required.